If the Fire Doesn't Kill You ... the Smoke Might! I consider us pretty set in terms of preps, we have food, and food redundancy; like a garden, and multiples of food preservation, we have a supply of water, a water catchment system, and access to bodies of water. And we have good perimeter defense and protection covered as well. However, what we don’t have is smoke protection. Let me clarify a bit, we have placed fire extinguishers in every room of the homestead, and barn, smoke and carbon monoxide detectors throughout, and our wood stove is sitting on a huge fire board and we have one fastened to the wall in back of the stove as well. However, all of these things are just to protect us from fire from the inside. What is concerning though is fire on the outside. I mean, the whole idea of living in the mountains is to be out of view from the golden horde, right? Ya know, “outta sight outta mind”? But living in beauty and seclusion, surrounded by trees and nature brings its own risks. Felled trees and …fire. Now, in a perfect world, they recommend that you remove all combustible debris such as dry grass, brush, stacks of firewood and, wooded fencing and posts within 30 feet from your home. This sounds like an awful lot of space; well it did to me, but it’s not. (Yeah I went out and measured.) My first thought was, “So much for hiding in plain sight if we’re going to have to cut everything down around the house.” I mean, we are talking about our homestead here, our bugging in place, our retreat, our hidey-hole, nestled a top a mountainous wooded paradise. So what have we done on our homestead to reduce our risks to outside fire risks? Firstly, we built the exterior of our home with a material that will not ignite when exposed to direct flame or contribute fuel to a fire. We also have a metal roof and interior sprinkler system. Instead of shrubs, we’ve placed large boulder-type rocks around the property as landscaping, and our driveway is a large swath of crusher run and rocks. In addition, we periodically remove all dead and felled trees; making room for new growth and minimizing the fire risk, which later becomes wood for the winter. We routinely clear the gutters of oak leaves, pine needles and other forest treasures. Oh yeah, and we store our fire wood far enough away from the house to avoid danger to the house, and we keep our gasoline cans and other flammable materials in a metal fire-resistant storage shed. So, you would think with all of this planning we would be set. Well, yes and no. The one thing that most of us do not consider is the smoke caused by fires. I know I sure didn’t. I had never been close enough to a fire to experience the choking effects of the smoke; especially smoke from a forest fire. That is, until a fire broke out in a wooded terrain, 10 miles from our homestead and rapidly spread from 100 acres to 6700 acres in less than two-weeks. For weeks, a thick blanket of choking grey fog-like smoke surrounded our homestead. I am sure you have heard the term “smoke em out.” And, although I'm not sure where exactly the term came from, I'm thinking that this is exactly what could happen if you are in close proximity to a forest fire - you could be “smoked-out” of your home with the intense smoke. You see, the danger of the smoke lies in inhaling the mixture of gases and fine particles caused by burning wood and other organic materials. These particles can get into your eyes and respiratory system and there is not much you can do less, stay indoors with the windows and doors closed. Our homestead does not have central air, so this does not apply to us, but if you do, you could run your air conditioner with the fresh air intake closed; making sure the filter is clean, to prevent bringing additional smoke indoors. And although, general-purpose 95N masks are not advisable to wear for smoke, as the tiny particles can still get through, we found that a respirator mask worn with a cover scarf helped in the interim when we were outdoors doing the animal and homestead chores. Unfortunately, the simple fact is, no matter how closed-up you think your house is, particles are still going to get in. So, avoid using wood fireplaces, gas logs, gas stoves, and yes, even candles that can catch fire. Now even with all this dismal talk, there is a silver lining to the miserable grey cloud of smoke …you do not have to vacuum! Yep, vacuuming stirs up the particles inside your home and can cause even more pollution in your lungs. Yay! A real excuse not to do housework! – Just sayin’. In addition, we periodically remove all dead and felled trees; making room for new growth and minimizing the fire risk, which later becomes wood for the winter. We routinely clear the gutters of oak leaves, pine needles and other forest treasures. Oh yeah, and we store our fire wood far enough away from the house to avoid danger to the house, and we keep our gasoline cans and other flammable materials in a metal fire-resistant storage shed.So, you would think with all of this planning we would be set. Well, yes and no. The one thing that most of us do not consider is the smoke caused by fires. I know I sure didn’t. I had never been close enough to a fire to experience the choking effects of the smoke; especially smoke from a forest fire. That is, until a fire broke out in a wooded terrain, 10 miles from our homestead and rapidly spread from 100 acres to 6700 acres in less than two-weeks. For weeks, a thick blanket of choking grey fog-like smoke surrounded our homestead. 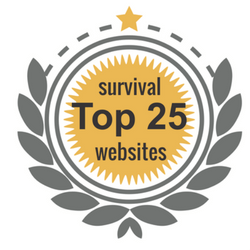 Thank you for sharing Survivor Jane with all of your friends! If you liked this ... then you will love my book, "Emergency/Survival Hygiene: A Prepper "Cookbook" for Survival Personal Hygiene Products", "What Could Possibly Go Wrong??? 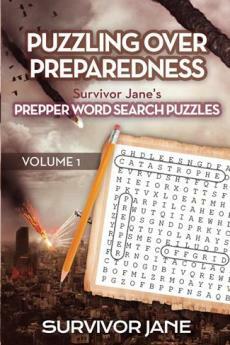 How to Go From Completely Clueless to Totally Prepared" and my NEW Book "Puzzling Over Preparedness - Survivor Jane's Prepper Word Search Puzzles"